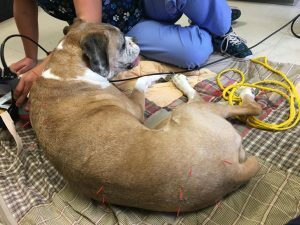 Abstract: A 10­ year­ old female spayed boxer dog named Mabel was treated over the course of three months with acupuncture, massage and laser therapy for myofascial pathology, suspected anxiety­induced seizures, suspect spinal pathology and resulting neurologic ataxia and urinary incontinence. 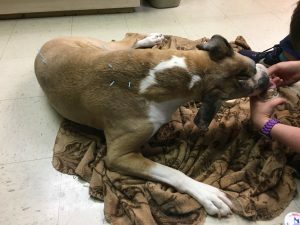 Mabel was treated with dry ­needle acupuncture, myofascial massage and laser therapy. Mabel showed a decrease in HR and blood pressure during therapy sessions. Mabel also showed a partial improvement in neurologic exam findings and urinary incontinence with long­term treatment (3 months). History and Presentation: Mabel, a 10 year ­old, female spayed boxer presented June 18th, 2018. The owner reported that she had a several year history of slowly progressive chronic hindlimb (HL) weakness and ataxia, urinary incontinence/infection, seizure-like activity and previously excised cutaneous neoplasia. Her pertinent medical history includes intermittent urinary tract infections (about once every other year) that resolve with antibiotics. For the last few years she has leaked urine on her bedding when resting, and recently it’s been much worse. She had two cutaneous masses described first in her medical record in 2015: one on the left ventral thoracic area and one over the left dorsal shoulder. The left shoulder mass was surgically removed without complications, and the histopathology report indicated it was a soft tissue sarcoma completely excised. It appears to have not regrown in the same area, though Mabel has several other small cutaneous masses throughout her coat on presentation. The owner also reports that Mabel has had seizures in the past, but none for several years now. She is not currently being given anti­epileptic medication. Mabel also has a very dry nose ­ resulting in a hyperkeratotic appearance that has been progressive throughout her life. The owner has treated with petroleum jelly when possible. Physical Examination and Clinical Assessment: Her physical exam revealed ptosis, moderate nuclear sclerosis and mild dried discharge in both eyes. Both ears contained mild debris. Moderate dental calculus was present in the mouth with normal pink mucous membranes, with a capillary refill time of < 2sec. All lymph nodes palpated within normal limits (WNL). Heart and lungs auscultated WNL. At a walk Mabel exhibited circumduction of hindpaws laterally with an exaggerated ataxic gait. She had difficulty moving out of a sitting position with severe HL muscle atrophy. She had decreased to absent proprioceptive placing of both HLs on exam with intact motor and sensation. Patellar reflexes and withdrawal response of both HLs were exaggerated. No significant crossed extensor reflex was present when tested. There was a significant decrease in range of motion (ROM) and crepitus of the coxofemoral joints, stifles and elbows and some mild discomfort on movement of each joint. Her body condition score was 4/9. Her elbows both rotate inward when she uses them to walk or puts weight on them and she carries a majority of her weight on the thoracic limbs. On myofascial palpation trigger points were identified in the pectoral muscles (mm.) bilaterally and between the scapulae near bladder points BL12­BL15. The gluteals, biceps femoris and quadriceps also had taut bands and restrictions on palpation. Urinalysis at the first appointment showed a USG of 1.001 (free­catch sample), pH of 7, with occasional WBCs, RBCs, renal epithelial cells and occasional cocci seen on sediment analysis. Mabel was prescribed amoxicillin which seemed to clear up the symptoms over the coming week. Some incontinence remained however, as described by the owner in later appointments. This seemed to partially respond to DES, and the owner was not concerned about the small continuing amount of urinary incontinence that remained. The owner did not pursue any further diagnostics or imaging (bloodwork, radiographs, urinalysis were recommended). Differential Diagnoses: Differential diagnoses for Mabel’s drooping eyelids, mild eye discharge and dry nose included a peripheral neuropathy affecting parts of the autonomic nerve branches innervating these regions. Nasal parakeratosis can also be partially due to an autosomal recessive genetic predisposition described in labradors but seen in many breeds (Page et al 2003). Overall systemic autonomic imbalance is likely a component of these conditions, and is suspected to have had an effect on the spinal / hindlimb dysfunction seen as well. Other Horner’s symptoms (miosis, enophthalmos) were not observed. Mabel’s multiple skin masses were not definitively diagnosed due to the owner declining diagnostics. Differentials might include soft tissue sarcomas (similar to the mass previously removed), although this type of tumor usually is restricted to local recurrence and invasion. Other possibilities may include benign or malignant cutaneous neoplasia of many different types. Differentials for Mabel’s past seizures include intracranial causes such as vascular, neoplastic, inflammatory processes as well as an anxiety associated seizure condition. This last differential may be the most likely, as the seizures have not happened for some time without medical intervention. These incidents could alternatively describe another pathological process causing sudden loss of consciousness, including syncope. Further diagnostics were declined. The internal rotation of Mabel’s elbows is likely secondary to the amount of weight that she has to put on the elbows to off­load the HLs. Likewise, the pectoral mm. are likely overworked as well for the same reason, resulting in the myofascial restriction / trigger points palpated on exam. The crepitus and decreased ROM of the elbows suggests some OA present at this region as well. Once again, radiographs and further diagnostics were declined by the owner. Mabel’s spinal issues were her main problem from the owner’s perspective and possible differentials for spinal pathology may include neoplasia (primary or metastatic), vascular (thrombosis, FCE, hemorrhagic), inflammatory/degenerative/autoimmune (OA, IVDD, degenerative myelopathy, other) causes. A chronic, degenerative process however would be more likely than an acute process due to the history of chronic slow onset. An upper motor neuron lesion is suspected due to increased reflexes with decreased to absent proprioception and significant ataxia and weakness of the HLs at a walk. OA of the hips and stifle are also suspected due to findings on palpation / manipulation of these joints. Definitive (or Putative) Diagnosis (or Diagnoses): There is a suspect neoplastic or degenerative process of the thoracolumbar spine causing upper motor neuron signs of the HLs. OA of the elbows, hips and stifles is suspected. An autonomic neuropathy is suspected causing ptosis of the eyes, decreased tear production and hyperkeratosis of the nose. A past history of anxiety associated seizures is suspected. Mabel was found to have a urinary infection on urinalysis. This was treated to partial resolution with amoxicillin and the remaining minor incontinence seemed to respond mostly to D.E.S. This may confirm a diagnosis of sphincter mechanism incontinence. Medical Decision Making: It was immediately clear that Mabel normally has high sympathetic tone, so one of the main goals of treatment was to modulate the ANS. The first treatment was in a busy area of the hospital, and as a result Mabel was overstimulated. In successive visits we treated her in one of the quieter rooms and this helped with autonomic balance. Central and peripheral autonomic targets were chosen to help modulate the ANS. The thoracolumbar pathology and the resulting upper motor neuron signs were treated with local spinal (BL line) acupuncture and laser therapy, and distal points were used to encourage proprioception and proper function of the peripheral nerves of the HLs. Points around the hips/sacrum, stifles and elbows were also treated with acupuncture and laser, targeting myofascial restriction and osteoarthritis. Genitourinary spinal points, distal points and laser therapy were used to encourage urinary health and proper function of the urinary sphincter mechanism. Traditional medical therapy was also utilized (D.E.S). Local treatment of myofascial restriction and trigger points was also performed when such restriction was found. The treatments spanned from the middle of June to August (8 total treatments over about 3 months). With successive treatments similar points were used, but these varied depending on the state of the myofascia as well as practical (often positional) reasons at each separate appointment. After several treatments I became more familiar with Mabel and I was able to find some more subtle signs of pathology in later treatments, so the treatment regime expanded over time. Acupuncture Treatments: Seirin 0.16 x 30mm dry acupuncture needles were used exclusively. The five main indications that informed treatment protocol included autonomic, musculoskeletal, neurologic, urogenital and local myofascial pathology. Myofascial release and autonomic balance was targeted during the myofascial massage and exam at the beginning of each appointment. Afterwards autonomic points were placed including GV14, GV20 and Bai Hui. In later appointments ST36 and LI11 were added both for autonomic and musculoskeletal indications of the knee and elbow. BL27, BL28, BL29 were used to target the sacral spinal segments and the descending peripheral nerves of the HLs. KI3 and SP6 were used in later treatments to stimulate the Tibial nerve and resulting local, regional spinal and long loop reflexes. Baxie points were used on both HLs to help stimulate proprioceptive innervation to help treat ataxia due to suspect upper motor nerve pathology. As mentioned ST36 was also used for its local stifle musculoskeletal and peripheral nerve stimulation indications. Urinary function was targeted using BL23, BL52, and BL27 / BL28. Trigger points were found every appointment during myofascial exam in the pectorals and longissimus and ileocostalis mm. These were treated with local trigger point stimulation as well as BL3­5 points. At two of the appointments trigger points were also found in the infraspinatus and supraspinatus muscles, and these were treated with SI11 And SI12. All of the points described were attempted bilaterally at every appointment, but occasionally autonomic balance (encouraging parasympathetic relaxation) took precedence over bilateral point placement. 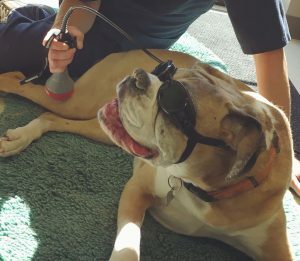 Laser therapy was also administered at later appointments with the Companion Therapy Laser, CTX­15 (class 4, solid state, 810, 980, 650nm). The areas treated were the elbows, the hips, the lumbar spine and the stifles. The elbows were treated for 3:45 min at 7.0W for 1260J. The hips were treated for 4:55 min at 8.0W for 1888J. The lumbar spine was treated for 5:23 min at 8.0W for 2068J. The stifles were treated for 5:39 min at 7.0W for 1897J. All areas incorporated continuous wave and pulsed wave therapy. Outcomes, Discussions, and References: The first of the major targets for therapy was autonomic balance. A lifetime of high sympathetic tone is suspected to have significantly attributed to Mabel’s cranial nerve dysfunction and suspected anxiety associated seizures. The autonomic points chosen, myofascial massage and the environment of treatments helped reduce Mabel’s stimulation, heart rate and blood pressure during treatments. This concurs with many previous studies focusing on the effects of acupuncture on autonomic function (Armstrong et al, 2017; Wang et al, 2016). Myofascial restrictions were also successfully treated in the pectorals, back and hips via myofascial massage and dry needling of trigger points. Electroacupuncture was not available at the time of the treatments at the hospital, but would have been indicated and would likely have improved the myofascial response to treatments (Cuignet 2018; Wang et al 2017). Mabel’s neurologic function was targeted with treatment as well, specifically the upper motor neuron pathology of her HLs. The owner declined diagnostics so the exact etiology of the suspect spinal lesion was not found, but general treatment did have positive effects. For example the Baxie points were always stimulating to her HLs during treatments, and likely improved proprioceptive capabilities in her HLs along with other points. Once again, evidence suggests that electroacupuncture may have caused a more significant response (Choi and Hill, 2009; Zhu et al, 2013; Sanchez­Mila et al 2018). Mabel’s suspect urinary sphincter incontinence was improved a small amount through acupuncture and by pharmaceutical treatment (D.E.S). But this as well was only partial improvement and may indicate that the sphincter innervation was also affected by the suspected spinal pathology present. There were very few side effects of the acupuncture reported by the owner after appointments except for mild lethargy. As this was my first long-term clinical acupuncture case I learned quite a few practical lessons. For example, targeting the ANS in a highly sympathetically stimulated dog is very difficult in a stimulating environment. There was a much better response to therapy in the quiet room at the other end of the hospital. Practice placing needles has improved my ability to find certain acupuncture points, and has made me much more efficient. I’ve become more invested in the myofascial massage portion of the treatment, which seems to have dramatic effects on autonomic status and really improves the efficacy of the acupuncture that follows. The main lesson I have taken away from the experience with Mabel is that the owner’s involvement is paramount. Mabel’s owner was never present for the treatments, and due to this I never had a connection with the owner, could never talk to the owner about continuing treatments like myofascial massage at home and I don’t believe the owner valued the treatments as much. I have now started highly encouraging owners to be present for the treatments, especially the first treatment so a thorough history can be obtained. References: Armstrong K, Gokal R, Durant J, Todorsky T, Chevalier A, FaShong B. Detailed Autonomic Nervous System Analysis of Microcurrent Point Stimulation Applied to Battlefield Acupuncture Protocol. Medical Acupuncture. 2017; 29(2): 87­93. Choi KH, Hill SA. Case Report: Acupuncture treatment for feline multifocal intervertebral disc disease. J of Fel Med and Surg. 2009; 11: 706­710. Cuignet, O. The Effects of Electroacupuncture of the Myofascial Trigger Points on the Pain and Sensory Thresholds in Chronic Low Back Pain. ICMART­ISAMS 2018 World Congress on Medical Acupuncture. 2018. Page N, Paradis M, LaPointe JM, Dunstan R. Case report: Hereditary nasal parakeratosis in Labrador Retrievers. Veterinary Dermatology. 2003; 14: 103­110. Wang K, Chen L, Wang Y, Wang C, Zhang L. Sphenopalatine Ganglion Acupuncture Improves Nasal Ventilation and Modulates Autonomic Nervous Activity in Healthy Volunteers: A Randomized Controlled Study. Scientific Reports. 2016; 6(29947): 1­9. Wang R, Li X, Zhou S, Zhang X, Yang K, Li X. Manual Acupuncture for Myofascial Pain Syndrome: a Systematic Review and Meta­Analysis. Acupuncture Med. 2017; 35: 241­250. Zhu Y, Qiu M, Ding Y, Qiang Y, Qin B. Effects of electroacupuncture on the proprioception of athletes with functional ankle instability. World Journal of Acupuncture. 2013; 23(1): 4­8. I was blown away by the experience and I am extremely grateful for the knowledge and general approach I’ve gained. There’s some real, down-to-earth wisdom in approaching a physical exam as a massage, using your hands to diagnose and treat. The extra palpation finds things you would miss, and talking to the owner more about things like nutrition brings up some really important topics and benefits the patient.